Where do you want to SHOP today? Aaron's General Store.com web site is the "parent" web site for 15 Fastener Specialty Stores. Each of the 15 stores use this web site for a common credit card facility and shopping cart. To select an item for purchase from any of the Specialty Stores just click on one of the hot links below. Screw Manufacturing for special items at our screw manufacturing facility. Our group of 12 Specialty Stores sells a variety of fasteners to oem's, end users, government agencies, fastener distributors and to the general public. These web sites are designed to make it easy to find the specific item you want and easy to buy the item directly on the web site. All web sites are connected to the same shopping cart so that any item selected from any site will automatically be placed in the same shopping cart. When you check out you will be checking out a single shopping cart which may have items in it from any or all of the specialty store sites. We accept American Express, Discover, Visa and MasterCard as well as checks and bank wire transfers. Everything is pre-packaged in bulk cartons and is sitting on the shelf in our warehouses ready for immediate delivery. The prices for these bulk cartons are very attractive and are your best deal but if you should want less than a full carton we will be pleased to provide them. Prices increase significantly for small purchases because of the high cost of labor involved in retrieving the carton from the warehouse, breaking the carton, counting the parts and repackaging in bags of 10, 100 and 1000. Shipping time for less than a full carton may be same day to several days depending upon which warehouse has the full cartons. Every fastener is of the highest quality and all prices are fair and reasonable. You do not have to wander through bed knobs and broomsticks to get to the specific fasteners that you need like you would at your local hardware store. You just click on the hot link and go directly to our Machine Screws web store if you want inch size machine screws, machine screw nuts or machine screw washers. We have a large variety of these screws, washers and nuts in steel, stainless steel and nylon. You can have a stainless steel screw with standard plain finish or with black oxide finish. You can also have steel screws with zinc plating, black oxide plating or just about any finish you can imagine. Nylon fasteners also can be found in natural white or black finish. We have many SEMS screws on the SEMS Machine Screws web store. Some SEMS have a single washer such as split lock washer, flat washers, internal tooth lock washer, external tooth lock washer and others have a double washer consisting of a flat washer and a split lock washer. We have them available in metric and inch sizes, as well as having Torx drive (i.e. star and six-lobe) in SEMS. Torx drive screws are generally concentrated in our Torx Screws web store. We have both Machine Screws and Cap Screws as well as Thread Forming Screws, Thread Cutting Screws and Self-Tapping Screws on this website. You can purchase online which is easier, faster and more accurate or you can place your orders by fax or toll free phone. Torx bolts and screws are very popular in the automobile industry, sheet metal industry and plastics industry. The stainless steel screw is the most popular although all of the sizes are also available in alloy steel with black oxide finish. Our Metric Screws web store has quite an extensive collection of metric fasteners such as metric machine screws, metric bolts, metric machine screw nuts, metric machine screw washers, metric thread forming screws, metric socket set screws, socket head cap screws, button head cap screws, flat head cap screws and metric hex wrenches. We also have metric bolts with in both coarse thread and fine thread as well as partial thread and full thread. A metric bolt size over a wide range is listed on the web site. The Cap Screws web site has the standard hex head bolts, socket head cap screws, button head cap screws and flat head cap screws as well as a variety of specialty fasteners. You can find Carriage Bolts with square neck or ribbed neck. You can find an Elevator Bolt with No. 1 Norway head, No. 3 Eclipse head or Fanged head. There are Grade 8 Frame Bolts in both coarse thread and fine thread. Grade 5 and Grade 8 Plow Bolts, Step Bolts and Structural Bolts as well as Grade 2 and 5.1 Flange Bolts can also be found on this web site. You can also find Grade 2, Grade 5 and Grade 8 Tap Bolts (full thread) at this web store. Cap screw nuts and cap screw washers can be found on the machine screws web site. Most of these bolts are steel/zinc but we also stock stainless steel bolts. As you will see on our Security Screws web site, there are many kinds of security screws. We specialize in the Hex Pin and Torx Pin variety of security screw. We have an extensive inventory of Torx Pin security screws and a modest inventory of Hex Pin security screws. On the web site you will find machine screws, cap screws, self-tapping screws, thread forming screws and thread cutting screws with the majority being button head cap screws and flat head cap screws. Sometimes you may see these screws listed as tamper proof screw or tamperproof screw. At this Self-Tapping Screws web site you will find Type A and Type AB sharp point self-tapping screws, Type B blunt point self-tapping screws, self-piercing screws and Type B High Low Thread self-tapping screws, These screws are also listed without the hyphen i.e., a self tapping screw and sometimes referred to as a sheet metal screw. We have pan head, flat head, hex head and hex washer head screws. Some are 410 stainless steel, some are case hardened steel and some are 18-8 stainless steel. Finishes include the standard plain finish, zinc plated, black oxide and nickel. Wood screw thread where the threads are far apart and the screw will normally be inserted into an unthreaded hole where it makes it own threads as it is inserted. 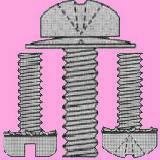 At our Wood Screws web site you will find many different types of screws but all with wood screw type threads. There are wood screws in steel/zinc plated, stainless steel and brass. We also have drywall screws, particle board screws, deck screws, framing screws, dowel screws, hanger bolts and lag bolts. Military Screws are generally the same as some commercial screws with a few exceptions. Generally military screws are manufactured in the USA or Canada, they are of a higher quality, they are often Cadmium plated and the flat head screws have a 100 degree countersink. Normal commercial flat head screws have 82 degrees on the countersink and Metric screws have 90 degrees on the countersink. Military screws are generally more expensive than commercial counterparts. We have Pan Head screws, Flat Head screws, Fillister head screws, Socket Head Cap Screws and Hex Head Bolts on this web site. We provide Screwdrivers, screwdriver bits, adapters and wrenches as required by our customers who purchase screws. These are generally high quality tools and are reasonably priced to benefit our current customers. We also provide screwdriver bits for a wide variety of drive types although the Torx Socket, Torx Socket Pin Security, Phillips, Slotted, Pozidriv, Hex Socket, Hex Socket Pin Security and Square drive are the most popular. Clutch, Frearson, Torq-Set, Hi-Torque, Sel-O-Fit and Tri-Wing are also available on this web site. We made a dedicated web site for Silicon Bronze Fasteners and feature Hex Head Bolts, Nuts and Washers. These are generally #651 silicon bronze bolts and nuts. The washers are generally phosphor bronze. This type of fastener is generally used in the electrical industry where good conductivity is needed as well as in marine applications where corrosion resistance is required. Our Pushnuts web site specializes primarily in round pushnuts for threaded fasteners and unthreaded shafts, rectangular speed nuts for machine screw and self-tapping screw applications and nylon PUSHnTWIST nuts which can be pushed on and tightened with less than 360 degrees of motion. We expect to open new stores in the next year that will specialize in stainless steel fasteners, thread cutting screws, thread forming screws, self-drilling screws and black oxide screws. We also expect to expand our offerings in Torx head fasteners and add to our metric machine screw base. Our other metric screw and Torx screw base will also be expanded. The metric fastener is being accepted in the USA much faster in recent years and we expect that trend to continue.